Team - Ignite Yoga - A Powerful Yoga Community in Dayton, Ohio Team - Get to know us. Dedication. Energy. Personality. We lead with these ideals and qualities to make your experience calming, inspired and tailored. We will reach the areas in your life that need touched. Our team at Ignite could simply not be more diverse. Each instructor brings his/her own life influences, experiences and skill sets to every class, making each session unique and memorable. Our team truly has a passion for our teachings and beliefs, and this energy is infused into every movement and step. The energy and support doesn’t stop at the mat—the lessons and love can be extended into every area of your life. This is a philosophy that all of our instructors share—yoga is more than a practice, it is a way of living. We hope to impart this onto each and every one of you to take with you both on the mat and once you walk out the door. Justina Sanford began practicing yoga in 2008 and quickly began experimenting with Hatha, Ashtanga, Iyengar, Anusara, Bikram and Power Yoga. She completed her yoga training through the Baptiste Power Yoga Institute and is the only certified Baptiste yoga instructor in the Dayton area. In the studio, she keeps her classes light-hearted, challenging, and supportive. When she’s not in the studio, Justina is hanging with her husband and dogs. She loves to sing, cook, hike, or be active in any way. Joane Wire is a registered dietitian who has spent the last 20 years focusing on health and well being. Yoga and meditation have been an important part of her own wellness journey, which lead her to complete 200 hour yoga teacher training and become certified through the Chopra Center in meditation. Joane is a full time mom of three teenagers. She enjoys spending her free time with her husband traveling and spending time outdoors doing anything from hiking and biking to kayaking. Katie began practicing yoga at her local YMCA in 2009 and slowly built a steady home practice over the following years. Her desire for community led her to Ignite Yoga where she completed her 200 hour teacher training. Her classes are laid back and cheerful. As a mother of three boys she has learned to keep a cool head and an open heart, those lessons shine through in her teaching. Some of Katie’s favorite things to do outside of the studio include playing in the sunshine, creating meaningful jewelry, loving up her family, and generally trying to enjoy all that life has to offer. 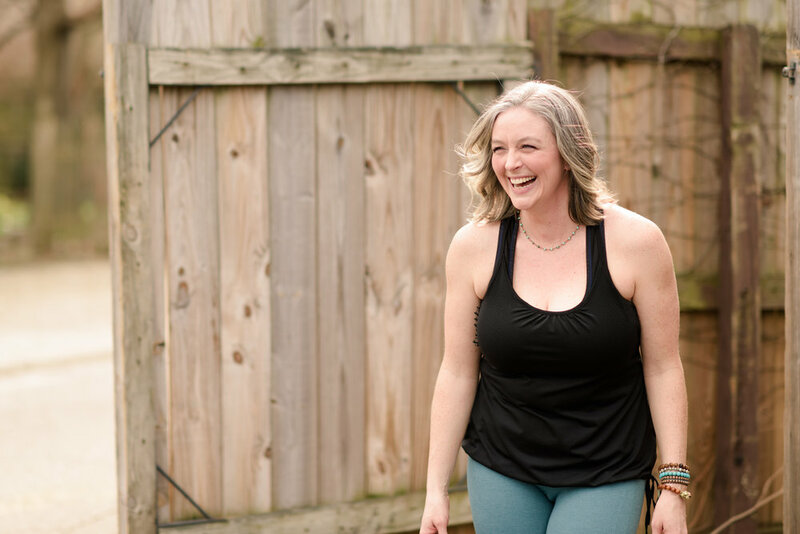 Kim has been teaching yoga since 2004, and was co-founder of Practice Yoga, the first Dayton area yoga studio to offer traditional Ashtanga and hot vinyasa yoga classes. Her ultimate philosophy is "any amount," which she uses as a metric to gauge the usefulness of various asana for the individual. Currently, she is turning her inquiry to biomechanics outside the traditional yoga realm. Kim believes that the true worth of a teacher is her ability to inspire others to realize their potential. Outside of the studio and work, Kim is entertained with her 3 rescue pups or enjoying the company of good friends over a tasty glass of Cabernet. Reka (ray-ka) is a 200-hr RYT and power yoga junkie. Give her a heated room to practice and she is in sweaty heaven. A Hungarian-born, American-trained graphic designer she loves teaching yoga as a way to detach from all things design, computers—and tune into all things breath, flow, and deep assisting. Marisa initially was drawn to yoga for the physical benefits of the practice. Shortly thereafter, she experienced the mental aspect which solidified her devotion to the practice. As a psychologist, Marisa is particularly drawn to the mental practice of yoga and the integration of yoga in the mental health field. Her passion for teaching yoga stems from her desire to share the multitude of benefits that yoga has to offer. When Marisa is away from her mat, she enjoys spending time with her family, friends, traveling, and fishing. Courtney found yoga during her first pregnancy, a little over five years ago. She is lover of everything yoga, but practicing power vinyasa and ashtanga is her absolute favorite. She completed teacher training through Ignite Yoga and couldn't be happier! She loves leading a powerful and energetic yoga practice for the Ignite Yoga community. (Especially super early in the morning!) She is also trained through ChildLight Yoga to teach yoga for children and finds it a gift to give yoga to little minds—it always leaves her smiling. Courtney loves laughing, cooking, reading a good book, and her cat. She is currently taking physical therapy classes in hopes of becoming a pediatric PTA in the future!